Lesley has been a Canfitpro Certified Fitness Instructor for more than 25 years. Along with having a busy family with two kids and a full-time job, she teaches 6 different types of classes a week (spinning, total body conditioning, cardio kick, awesome abs…) and is always learning. Lesley also keeps active by running, biking, skiing and taking yoga classes for her own enjoyment. As a personal challenge for herself, she runs two races per year just to have a goal to strive for and teach her class participants to try something they might not think they can do. Sporting Life 10k each spring and Scotia Bank 1/2 Marathon each fall. 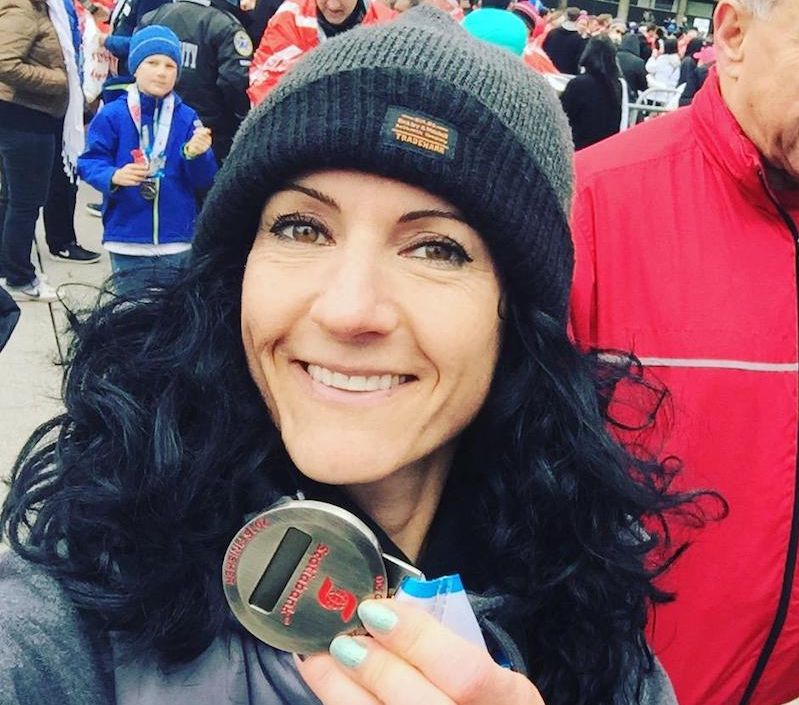 She has consistently stayed in the top 10 runners in her age group for her entire 40’s and continues to work hard each year to maintain that spot, even as she moved up in the age category. What type of sports did you play as a kid? I was NOT sporty as a kid at all! Learned to ski, swim, skate, but didn’t like group sports. I started working out in Grade 13. Remember that! What does a typical day look like in terms of what you eat? Breakfast -multigrain toast with peanut butter and a cup of tea. Second breakfast – coffee yogurt and fruit. Lunch – lots of fresh veggies and a sandwich or whole-wheat pizza bagel. How many times a week do you exercise and what are some of your preferred types of exercise? I exercise 7 days a week usually. I teach classes (spin, total body conditioning, cardio kick, abs) 3-4 days a week and run and do yoga the other days. I also ski in the winter and bike in the summer whenever I can. What injury prevention tips do you have for post 45 athletes? For injury prevention stretching is your best bet. I am very tight from all my running and yoga has totally improved my performance and helped with my flexibility immensely! What are the top 3 supplements you would recommend for athletes over 45? I’m not really a huge supplement taker. I just eat FOOD! I take a multivitamin every day just in case I missed something and 1000iu of vitamin D.
What is your number one fitness tip? #1 Fitness tip – find something or a bunch of things that you love to do and keep doing it! Remind yourself how good it feels when you are active and remember that the time you take to exercise is for your physical AND mental health too 🙂 It is the best gift you can give to your body. Lesley is a phenomenal instructor and a huge inspiration. She is super energetic and motivating and she cares about each and every one of her participants. She takes pride in our progress and is always encouraging. She has been the most influential person in my fitness journey, and has significantly improved my life. So happy to see her featured here. Lesley is an inspiration to everyone who knows her! She has more energy and enthusiasm than anyone I know. She is welcoming and accepting and motivating and fun to be around. Not only is she an amazing instructor but she she helps to enhance everyone’s experience when she is participating. She is one of those people that you wonder….how does she do it all? She does it with love and passion.